I hope everyone had a good New Year! I’m taking a break from working on digital cleanup on Flip Flap to write a little. In the Thunderbean world: I’m still somewhat obsessively working on finishing the things I have here for Flip the Frog and Rainbow Parades. I feel like I’ve been saying enough about those titles for the moment, so I’ll concentrate on things not related. I will say I had the best cleanup week here in a long time, doing cleanup and putting finishing touches on 6 of the Rainbow Parades and four more Flips. I think the oddest films are especially interesting, and the WW2 seems to provide a treasure chest of oddball shorts; many of these were better known (especially the Snafus and some of the Disney shorts) but others really remained nearly unseen. 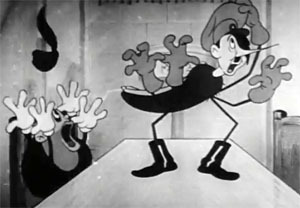 To this day, there isn’t any kind of complete list of the animated films that were sponsored by the United States Government; since many of the companies that were hired were independent, the production records that have survived on those films are limited to whatever correspondence with the branch of the government produced the film. Much of this paperwork exist at the US National Archives, often along with the really fascinating films that are referred to. The cataloging there at times makes it hard to track them down, however. I’m hoping at some point to do another deep dive in there. When I was working on “More Cartoons for Victory’ I was lucky enough to track down some real oddities, but there are more things there that are either not catalogued or haven’t been officially listed as ’animation’. I did manage to get through all the animation that was contained in *all* of the Army/Navy Screen Magazines. Since those were officially productions of the First Motion Picture Unit of the Army, there is an excellent paper trail related to the films they made. For films produced for the Navy, however, it’s a really different story, with lots of productions scattered to the wind. I have yet to see any kind of complete filmography of films made for the Navy. This short, Six Legged Saboteurs (1943) produced for the US department of Agriculture, made its rounds to both the Military and civilian population. The paperwork on the film makes a note on changes to footage for non-Military viewing, including a change to the title sequence. This version of the film seems to be the one to show to the civilian population (The military versions usually mention whether a film is classified or not and usually list the year). I have to wonder what the Military purpose of the short may have been given how this version seems specifically aimed at a non-military viewer. I find it an especially odd short in its attempt to find a correlation between war enemies and mosquito/bug problems related to agriculture. I’d love to see if the military version exists and what is different. The Youtube channel ‘Vegan Pop Tarts’ was nice enough to post our scan/ cleanup of the short. Here’s a past post on How War Came one of the specialty shorts produced by Cartoon Films Ltd. My guess is that they made a distribution arrangement with Columbia since they already had some relationship with the company, having done animation production for cartoons that were released as part of their Color Rhapsodies Series.